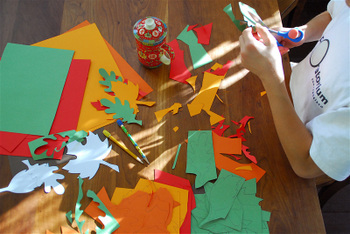 Here's an easy little project to keep the kids busy today and it makes a festive decoration. We used leaf templates I already had from a few years ago, but you can find similar ones here. 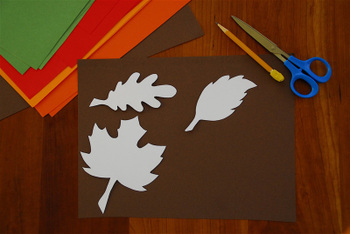 Cut out leaf shapes from fall-colored papers. 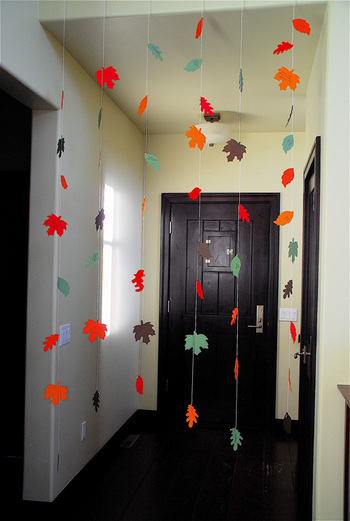 Everyone write something they are thankful for on a leaf, then string them up or use a garland. Have a wonderful day! We made one yesterday in lieu of a Thanksgiving feast. I have to say it was the first craft, found online, that actually occupied my girls for more than 5 minutes and turned out nicely. Thanks for the idea! I have a little pic on my blog, just of the leaves -- and something special my 8 year-old was thankful for. Oh I love this, we are going to do this! Love these leaves! They are like a sneak peak into what awaits inside! Wow, thanks for all the great comments, I really appreciate it! PS. Christin, I just folded the stem over the string and stapled it on. I love this... I was looking for a project to do for my MOMS club. This might be it! Thanks! Great idea!!! We'll do it this weekend!! What a beautiful and thoughtful idea! I've just seen this on Crafty Crow - it looks beautiful. Canadian thanksgiving has long gone but I could a Christmas version of this would look great! Cami - THAT is the perfect garland! I love it! Cami, this is lovely, and so much classier than the usual Thanksgiving tree with leaves we've done in the past. 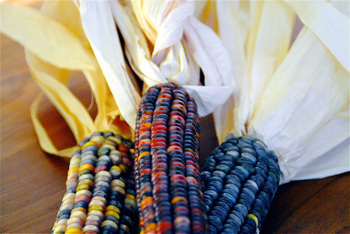 My 10yod wants to make some today, because we're not having our Thanksgiving celebration 'til tomorrow (yesterday and today being usual work days here in Canada). That is such a good idea. We did this once with real leaves (that we laminated) and stuck them on the fridge but this would be so much better. I wish that I'd read this sooner. Maybe we can still do it. Why not?